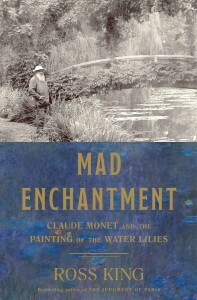 Ross King’s account of how Claude Monet (1840-1926) came to paint his famous water lilies is surpassed only by a visit, despite the hordes of tourists, to his home and gardens in Giverny, France. Neither a personal visit nor this account is to be missed. King’s previous efforts, such as Brunelleschi’s Dome or Michelangelo and the Pope’s Ceiling, confirm his genius for making historical figures and their brilliance spring to life in engrossing historical narratives. King has a gift for blending the fruits of extensive research into a rich and readable story that immediately captures and maintains the reader’s attention. The story of Mad Enchantment begins near its end: it is 1914 and Georges Clemenceau, prime minister of France, has disappeared from the capital. As it turns out, he is on the way to his country house with plans to visit Claude Monet nearby in Giverny. Longtime friends, no one was more ardent a supporter of Monet than he, and he continued to promote exhibitions after Monet’s death. The gardens, begun in 1893, were a famous and much sought-after destination. The lucky were permitted to enter and walk about; others were only able to see the gardens through a gap in a stone wall, a concession permitted by Monet. One entered the gardens, as we do today, through a tunnel beneath the street and the railroad, emerging before “the domain of water lilies,” as one journalist described the view. The lilies, a new hybrid created by Joseph Bory Latour-Marliac, were, in Monet’s view, something to please the eye and produce “motifs to paint.” They were the first colored water lilies in Europe. He so loved his garden that he seldom painted anything more than a couple of miles from his home. He was often described as more of a gardener than a painter. Ironically, the man who had been painting scenes that represented the heart and soul of France was originally viewed as a horzin, an outsider, when he came to Giverny. As his garden matured, his paintings, nearly 300 of them over 25 years, became more focused there and less on the countryside. Legend has it that Clemenceau and Monet went down into his cellar where Monet had stored his early paintings of the gardens (particularly those of the water lilies). Monet was not painting due to his declining eyesight and the deaths of his beloved wife and a son. Clemenceau’s encouragement launched a rebirth of Monet’s passion for painting, a man “madly striving for the realization of the impossible.” It was not unusual, for example, that he might be found working on a dozen canvases at once in an effort to catch the effects of light as it changed through each seven minute period (a conceptual division of time he adopted). It seems that he was painting a moving picture on a series of canvases. 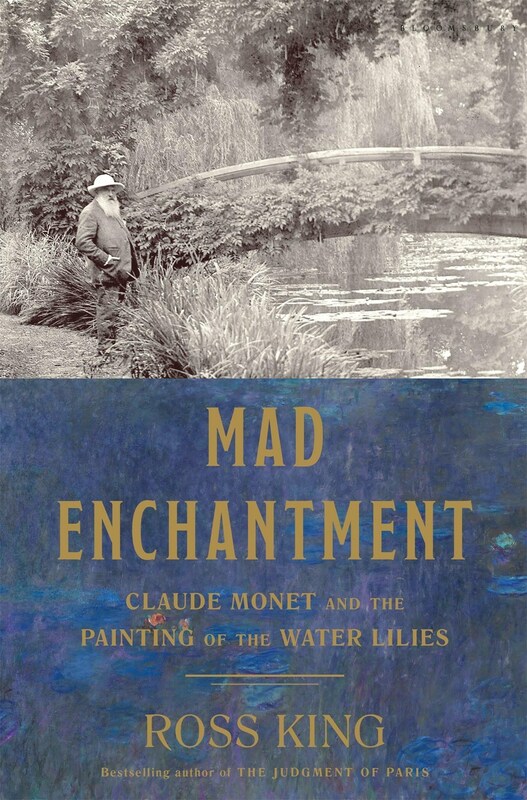 In Mad Enchantment, King has written a brilliant portrait of an artist who captivated his audience — although not all his critics — during his lifetime. Monet worried that he would not be remembered, but not only is he remembered today he is revered for the enduring beauty and genius of his paintings. His home and gardens remain a place of pilgrimage. This new examination of his life deserves a prominent spot among one’s reference books.